Happiness is clearly "sustainable" when you choose to "go green" for any occasion with this fresh and colorful bouquet designed in collaboration with the trendsetting stylists of Better Homes and Gardens. 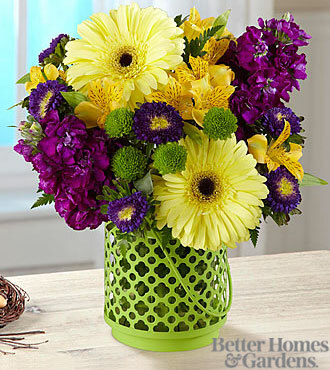 Deep, velvety purple stock becomes even more vibrant when hand-arranged with golden alstroemeria, buttery yellow gerbera daisies, green button poms and more. The lantern style vase features a clear glass cylinder in a metal holder of exotic inspired arabesques painted bright, spring green to pick up on the color of the flowers. Once the flowers are gone, the vase makes an enchanting candleholder for use indoors and outside.